One of the few good things about being old is that sometimes you can glean satisfaction from being in the right place at the right time, where you were lucky enough to have first-hand experience of something special. Nostalgia is the bread-and-butter of retro gaming and throughout its history there will always be moments that stick in a gamer’s mind, with memories of Sonic: The Hedgehog’s introduction to the world being one notable example. It was important that SEGA of the early 1990s created a credible platforming mascot to counter the elegance of Super Mario World, so in this context it was a massive turn of events to see Sonic first appear on a Nintendo system in 2002 (alongside the GameCube’s Sonic Adventure 2: Battle in Japan, 2001). 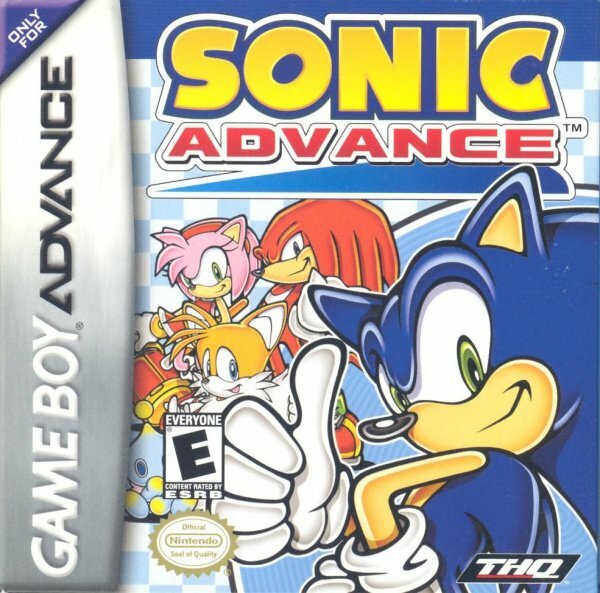 Thankfully, when Sonic Advance hurtled its way to the Game Boy Advance nine years ago its development was in safe hands, as a combination of a creative Dimps code-shop worked with the experienced Sonic Team, under the supervision of Yuji Naka as Producer. 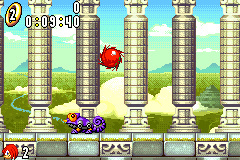 Dimps had previously developed Sonic the Hedgehog Pocket Adventure in 1999 on the Neo Geo Pocket Color, and this experience served them well in establishing the core mechanics for a Sonic game on GBA. 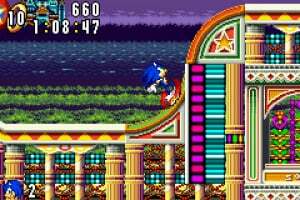 While Sonic’s foot-speed may feel slightly slower than the Mega Drive games, the 2D platform level layouts and obstacles are a continuation from the originals, as you set out to deter the dastardly Dr. Eggman from gathering seven Chaos Emeralds. You speedily navigate through loop-the-loops, conveyor belts, bounce on springs and collect rings, while keeping an eye out for speed boots, invincibility and protective barrier power-ups. You may be surprised to notice that the first level has set the Neo Green Hill Zone on a beach, complete with a tropical musical flavour that would fit well on a Super Mario Kart Koopa Beach track, but you soon find that Sonic Advance’s design takes a number of cues from its predecessors. It feels like a 2D Sonic game, with examples such as the spin dash and springy pinball themed casino zone from Sonic 2; you can even re-create the CPU controlled Tails from that title by inputting a cheat code. Visually it is lively and bright, with a taller, ‘modern’ design of Sonic that is wonderfully animated. It is a pleasure to watch him aquaplane across water-shoots, swing between hooks and whizz down zip-wires. Sonic fans will also appreciate that you feel in control of how he interacts with the environment. Set-pieces do not dominate the level layout; he may be able to grind down a rail but it is only for a short blast, the main focus is on traversing platforms. 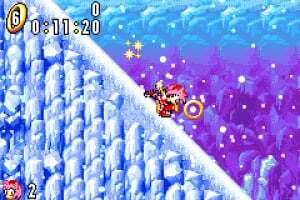 For example, a graphical highlight is the Ice Mountain Zone, with windswept snowflakes and chilly icicles that hark back to a similar looking stage in Sonic 3. The audio also manages to keep in tune with its predecessors, with its own themes that fit well with the series, alongside familiar sound effects for actions like invincibility and running out of air. There is diversity between the background visuals and audio, from a chilled-out funky jazz tune as fireworks set off in the Casino Paradise Zone, to more intense music during one of the game’s ten boss battles. Gameplay additions like anti-gravity sections in Zone 6 add flare to the visuals; in a similar manner to the retro classic Strider, the world is turned upside down. There are twelve main acts in the single-player game that can theoretically be completed in under an hour, as well as two extra zones. Despite a gameplay system that encourages you to rush, including a Time Attack mode, by the fifth Angel Island Zone it becomes apparent that you need to take care where you jump. This is not new to the series, but there are difficulty spikes in Sonic Advance, such as bottomless pits that become more prevalent in the final few zones. There are also more awkward Badniks to face, like Buzz Bombers and Caterkillers, as well as Spikers that shoot from the ground and can be difficult to spot, particularly on a tiny Game Boy Micro screen. The game is a breeze up until the fourth boss in Ice Mountain Zone, but becomes harder from that point on. Sonic Advance is not a game that revolves solely around Sonic, as there are three other selectable characters. It is important to understand that the level design is built around a variety of character abilities, not just Sonic’s sprint and leap approach. 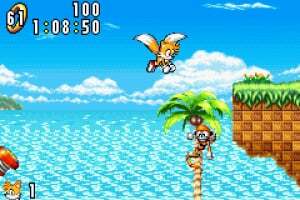 If you become stuck with Sonic, you may decide to start a separate game with Tails and find that flying with his propeller makes progression much easier when avoiding bottomless pits. The ability to be able to swim as Tails or Knuckles makes quickly grabbing air from the water’s surface more accessible, while controlling Amy gives the game a more traditional 16-bit platformer feel. She is noticeably slower than other characters and does not roll into a ball like the other three, though she attacks by swinging with her hammer. Alternatively, just like in Sonic & Knuckles, taking control of Knuckles enables you to glide into walls, which he is then able to climb. The variety of abilities between four characters opens each act up to alternative routes, adding to the replay value of the title. The challenge is varied, with the player able to change their character to aid progression as well as switching between Normal and Easy difficulties. 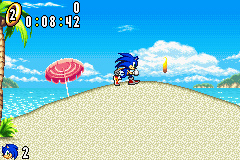 Sonic Advance has a number of extra gameplay options once you have completed the initial seven zones. Instead of collecting 50 rings, you search each level for a Special Spring that catapults you to a Special Stage, in which your character hurtles down a 360° tube while avoiding obstacles and collecting a set number of rings. The theme of this is a continuation of the Special Stage in Sonic 2, and if you are skilled enough to collect all seven Chaos Emeralds, you can unlock Super Sonic for an extra Moon Zone boss battle. Both single and multi-game pak four-player multiplayer is also provided. The single game pak sets players off with a timer to collect the most rings while attacking opponents, and the multi-game pak option enables two modes: Race and Chao Hunt. The Race has each player bolting towards the zone’s goal in the fastest time, and the Chao Hunt has them catching as many cute Chao characters as they can within a time limit. To round off a comprehensive package, there is a single-player mode based around the Tiny Chao Garden. This is a basic pet-simulation game, where you raise a small Chao creature and attempt to keep it in high spirits by petting it, feeding it fruit and purchasing toys to keep it entertained. There are two mini games in the garden: a card-matching game and a rock-paper-scissors based section, which earns you rings to spend in the store. The most interesting part of this is that you can link your GBA to a GameCube with an expanded Chao Garden, providing you have the console’s title Sonic Adventure 2: Battle. If in 1991 you were to tell a gamer that SEGA's prized Sonic the Hedgehog would spin onto a Nintendo handheld in 2002, it is possible they would burn you at the stake as a blasphemer. It is this historical turning of the tide that makes Sonic Advance such a potent retro title, but it is the way in which it maintains the classic feel of 2D Sonic platform game design that will keep you coming back for more. By incorporating four controllable characters, Dimps and the Sonic Team allow players to progress on their own terms. You can be slow and steady, scouring each level for seven Chaos Emeralds, or fast and impulsive, rushing to the final X-Zone. There is an enjoyable vibrancy to the backgrounds, as well as charming animation and audio that flows well alongside the classics of the series. Add multiplayer to the mix, as well as the Tiny Chao Garden that links to the Gamecube, and Sonic Advance is a treat for Nintendo and SEGA fans alike. In my opinion, the best Sonic game after the Mega Drive era ended. Sonic Advance 2 was great, too, but the first Advance definitely feels more like the Mega Drive games than anything else. Sonic Advance 3 was a glitchy mess that managed to be decent anyway. Sonics handheld on nintendo consoles turns out great, like the Rush games and Advance and colours, at the same time we look at stuff like Sonic knight thingie game and we just shake our heads. One of the last great 2D Sonic games! This was one of the best-looking games in the early GBA era. Looks great! Were all hopeful these type games will be coming to 3DS VC. @JamieO I believe you could link with both Sonic Adventure 2: Battle and Sonic Adventuer: DX to trade freely between the three games. Was there voice acting in this game? Great game. In fact, it seems that the handheld Sonic games are the ones that fare the best, and the console games suffer. Maybe Sega should just keep Sonic on handhelds. This one was pretty cool, but I liked its sequel a lot more. Great game, only beaten by the Rush games imo. This is the only reason I've kept my GBA (though I use my DS Lite for this game too). This was the first game I ever beat and the second game I ever owned. Knuckles was my favorite character, and I always called the invincibility upgrade flower power. This is also the only game I've ever had survive a trip through the washer. I'd love to see this, and especially Neo Geo Pocket Sonic hit the eshop in the future (I really have no way to play that one, whereas I can always track down a Sonic advance cart). Really well written review! I loved this game as a kid. Game was good when I purchased the original, which I still have. I remember playing this game when it came out, I never liked the graphics. I always wanted to play this one. I own the other two. @Dragoon: Sonic Advance didn't have voice clips. 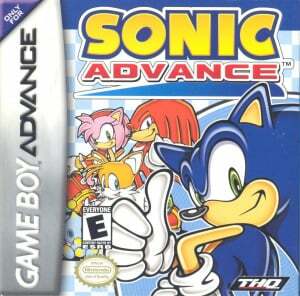 The only game in the Advance series that did was Sonic Advance 3. Someday I should play this game. It looks like fun, especially after reading this review. I owned Sonic Advance 2, which is fun but a bit too hard. Good review! Thanks for the comments everyone, I can feel the Sonic Advance love in this room, good on you all! (Cheers @Kid_A, that was a sound thing to say). @shinesprite Nice call on the Sonic Adventure DX GBA/ GCN link connection, you make a good point mate, I did not discuss it as much here because the GameCube Director's Cut version of Adventure came out a couple of years after GCN Sonic Adventure 2: Battle and GBA Sonic Advance (which felt a little bit back-to-front to me, as I did not own a Dreamcast to play them in correct order). @JirachiFan Yep, you're right, Cream's first appearance was in Sonic Advance 2. The four controllable characters in the first Sonic Advance are Sonic, Tails, Knuckles and Amy. @Swithom I am glad you mentioned the Egg Rocket Zone from Zone 6 (Act 1), because I have a bit of a love/hate relationship with that level. I love it really, because the concept of a rocket rumbling and preparing to launch into space is cool, but it is the toughest and longest level in the game, with a more maze-like design. It also has a large number of bottomless pits, some I found to be unfairly placed next to trampolines ricocheting Sonic into instant oblivion if I did not land perfectly on a moving spring. Then again, I like a challenge, and Egg Rocket Zone is the level that I've played the most in Sonic Advance. What do you guys think of Egg Rocket Zone? I remember loving this game back when it first came out. The second one didn't do it for me because Cream and Cheese were like the instant win characters. Just saw this and another Sonic Advance game at a local game store. I should pick one of these up sometime. Great game but one thing always confused me. Why do the Genesis games look and sound so much better? GBA was supposed to be a 32 bit system yet the Sonic advance games seem more primitive by comparison. Shouldn't it be the other way around? Truly this was Sonic 4. I think the next time I go on my retro gaming excursions I'll be looking for this game too. I've never played this gem, and I've truly missed out. Thanks for the great review JamieO! Very good game. I enjoyed this one a lot more than Sonic Rush. Never really cared for Sonic Advance 2 though, and I never tried the third one, though it looks a lot better. Meh. Sonic Advance was a great first Nintendo Sonic game, true. It's got great graphics and the core game is fine. But it's slow, the platforming is simple and the music is forgettable. Sonic Advance 2 though refines everything about the first game, improves in many areas, introduces great new mechanics that really elevate Sonic's 2D gameplay and bring some wonderful tunes to the table. Sonic Advance 2 is serious contender for best in the series; Sonic & Knuckles, Sonic Colors and Sonic 2 be damned! Sonic Advance 3 is also amazing too. But the first one is merely okay. I will be supremely disappointed if Nintendolife scores the sequel lower than this first one. @Pocketim Have to agree with you on the newer sonic games playing themselves. While Sonic Rush and Rush Adventure aren't that bad, I felt like for the majority of the level I was just holding right. My favourites would have to Sonic 2, 3 and Sonic and Knuckles for the Mega Drive (Genesis). This is what I consider to be the real Sonic the Hedgehog 4 as it builds upon the foundation 3 and K by adding a new character and features level design in the same style as the classics which Dimps gradually deviated from starting with Sonic Advance 2. I still don't get how Dimps could make this game and then mess up so badly on Sonic 4.